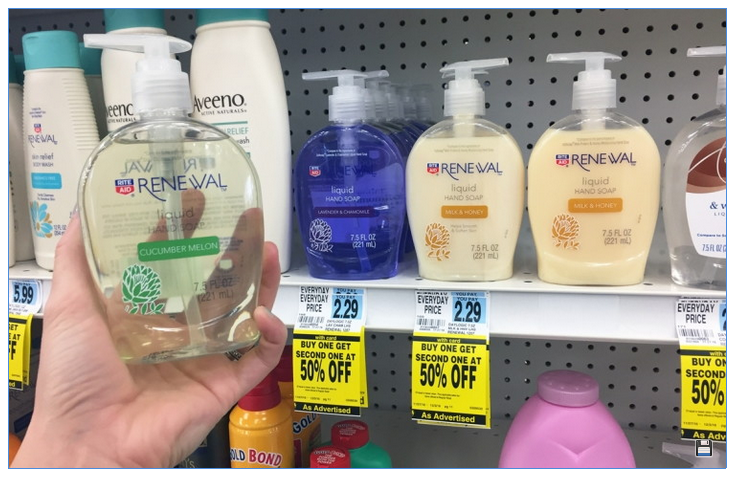 Score a nice deal on Rite Aid Renewal Hand Soap this week at Rite Aid! The hand soaps double dip, with a weekly sale price and a monthly Plenti Points promotion. Through 12/3, the soaps are on sale, buy one get one 50% off. Through 12/24, receive 200 Plenti Points when you buy two. Pay just $0.72 per bottle. The Rite Aid Renewal Hand Sanitizers are included in the same sale and promotion. Buy two and pay $1.24 per eight-ounce bottle. Just look for the products with two tags, as pictured below, to guarantee you are buying qualifying products. Total $3.44 plus receive 200 Plenti Points, making them only $1.44 or 72¢ each after points!